Back cover blurb: A mysterious keepsake, a murdered bride, a legacy of secrets... One balmy June evening in 1881, Phoebe Stanbury stands before the guests at her engagement party: this is her moment, when she will join the renowned Raycraft family and ascend to polite society. As she takes her fiancé's hand, a stranger holding a knife steps forward and ends the poor girl's life. Amid the chaos, he turns to her aristocratic groom and mouths: 'I promised I would save you.' The following morning, just a few miles away, timid young legal clerk William Lamb meets a reclusive client. He finds the old man terrified and in desperate need of aid: William must keep safe a small casket of yellowing papers, and deliver an enigmatic message: The Finder knows. With its labyrinth of unfolding secrets, Claire Evans' riveting debut will be adored by fans of Kate Mosse, Carlos Ruiz Zafon and Jessie Burton. 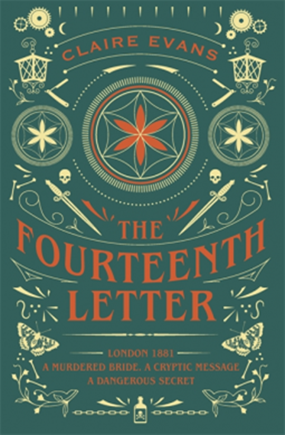 The Fourteenth Letter is a mystery of a novel, in more ways than one. William Lamb is waiting for a more exciting life. He is sure to make partner at the Solicitors where he is employed but needs to prompt his employer a little to get things moving. A chance visit to a usually unobtainable client whilst his employer is otherwise engaged leaves William with more excitement than he ever dared to wish for. When he returns to the office and tells his employer what he has done, somewhat shame facedly as William is not usually so forthright, his employer seems shocked. More shocked than William would have imagined. But his employer is not concerned with William's initiative he is concerned for his own life. So much so that he hands William an engraved box with an important message, before shooting himself. Presumably before someone appears to do it for him. What follows is an enthralling chase through London town. A mystery that needs solving quickly before more lives are lost. The Police are suspicious of William particularly after the death of his employer, but William has no time to worry about that, as he turns detective himself. 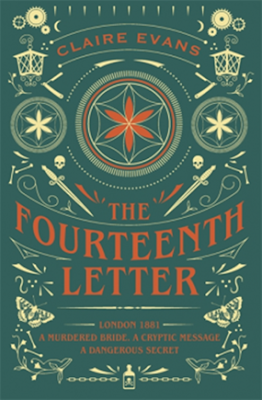 The Fourteenth Letter is available now via Amazon online and all good book shops.